My first experience with Thumper may have been a purely secondhand one, but it rattled me anyway. Walking through the Indie Megabooth in the middle of the expo hall, I was drawn to the thunderous noises of a nearby demo — none other than Drool’s surreal music game. Billed by developers Brian Gibson and Marc Flury as a “rhythm violence game,” it doesn’t take much observing before you figure out just how well that label applies. Winding, twisting camera movements, bizarrely kaleidoscopic imagery and the crashing savagery of the drums all add up to an audiovisual assault in the truest, and also best, sense of the word. But while all that is true of the PS4 version, which I observed from a distance on a relatively small TV, it’s not even close to the experience I had when I strapped on PlayStation VR and faced the violent rhythms in a hands-on (and headset-on) Thumper preview. Full disclosure: This was my first time ever experiencing virtual reality, outside of a few unremarkable demos with the Samsung Gear VR headset at a Best Buy (that doesn’t really count, does it?). 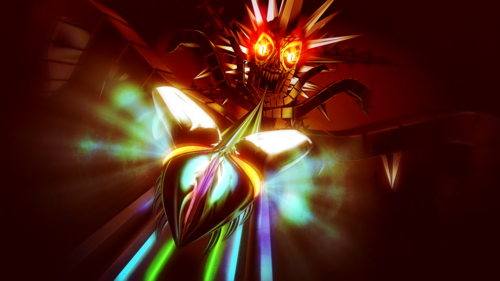 I did have some hesitation making Thumper my first real VR experience, particularly after I’d seen the demo the day before — being someone relatively sensitive to motion sickness, I was (irrationally) envisioning some sort of horrible trauma that would put me off of virtual reality forever. Instead, what I got was one of the most viscerally thrilling, enjoyable times I’ve had playing a video game in a while. And while that demo may not be enough to convince me that VR will be a resounding success in the industry, it was enough to convince me of its potential as a new way to experience video games; and likewise, enough to assure me that Gibson and Flury’s music game is one to keep a close eye on. At its core, the mechanics of Thumper are refreshingly simple despite all the chaos happening onscreen. 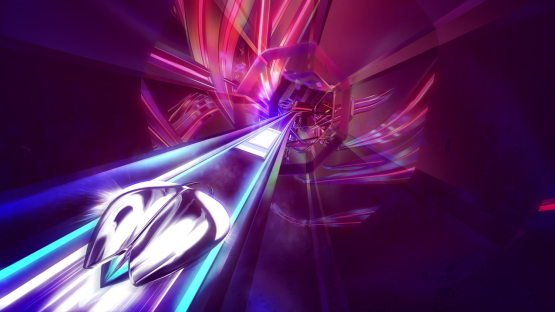 As your space beetle hurtles down its neon-colored track, you’ll come across a few different obstacles that need to be navigated: single lights along the track that need to be “thumped” by pressing X, clusters of lights you can “slide” through by holding the same button, and sharp turns that are navigated with a combination of holding down the button and turning the analog stick. That might seem pretty bare-bones, but this is a rhythm game: it’s all about keeping an eye on what’s happening onscreen, and following suit with the respective controls. That’s easier said than done, though, when you consider just how much of a shock to the system Thumper’s audio and visual components really are. Even on the small TV with the audio audible over all the other noise on the show floor, I was struck by how Drool’s “rhythm violence” idea really did come through in the physical sensations of listening to and watching the game. The winding, twisting, undulating realms unfold before your space beetle in hypnotizing patterns, but you’ll be woken quickly by the thumps, slides and turns — which actually sort of rattled me. And if they did that on the TV, you can only imagine how they were in VR. In a word, it was exhilarating: rather than the motion sickness I’d envisioned, I found that I thoroughly enjoyed the way VR tricked my brain into thinking I was really hurtling down that track. Each time I pressed or held X to thump, slide or turn, the physical feedback was that much stronger than watching from a distance, and I couldn’t get enough of peering around me to see the kaleidoscopic patterns form. And talk about a great finale — I had to suppress a whoop of excitement when the game’s villainous cranium, Crakhed, surfaced from the horizon to challenge me. Gibson and Flury are veterans of the rhythm genre, and that’s pretty clear both from their credentials (they’ve worked on games at Harmonix together for years) and the simple act of playing the game itself. 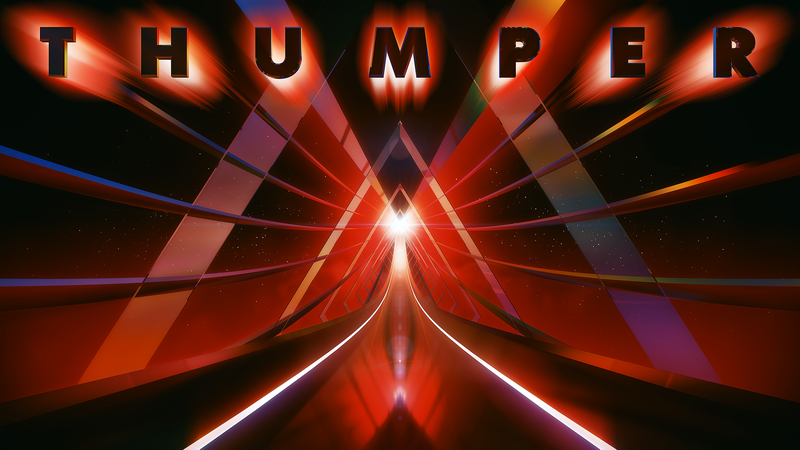 With a central conceit that can be learned in just a few minutes of play, no tutorials required, and a structure that encourages you to recognize sections of “notes” with the same sort of muscle memory required of playing an instrument, Thumper provided one of the most exciting experiences I had during my time at PAX East. While a release date has not been set yet, Drool intends to have you facing the rhythm violence head-on at some point this year on PS4 and PSVR — and if you’re a fan of rhythm games, or are just looking for something to convince you of VR’s potential, there’s no question in my mind that you should keep this one on your radar.